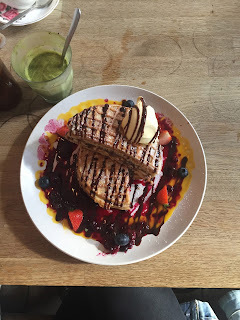 The Pantry is one of my favourite cafes for brunch (and that's a high rating because I love brunch and am always on the lookout for good brunch menus). Located on North West Circus place in Stockbridge, the Pantry is a cute little cafe with shabby chic décor where you're served your coffee in tea cups and your waffles topped with everything you could ever hope for. Every time I come to the Pantry I can't resist ordering the 'Epic Waffles' and trust me they are not for the faint hearted. Your plate is a endless layers of heaven including waffle with a layer of Nutella and sliced banana, another layer of waffle smothered in peanut butter, topped with another waffle then covered with fruits and fruit sauce, some icing sugar oh and a dollop of clotted cream. If you have a sweet tooth and love a cheat day on the weekend this is what you should order. I have managed to finish these – once – but whoever I'm with is always keen to help polish them off, they are that good. If you're not able to tackle the 'Epic Waffles' there's plenty of other great dishes on the menu. The 'Sunshine on Stockbridge' is a super tasty (and healthier) alternative to your usual fry up, featuring olive oil toast with smashed avocado, roasted tomato, aubergine and sweet potato, topped with a poached egg and available with optional chorizo. My sister had high praise for the 'Pulled Pork with Jalapeños' eggs Benedict and even declared it was the best eggs Benedict she'd had yet (and like I say we try a lot of brunch menus). The pulled pork wasn't drenched in sauce as some places tend to make it, you could actually taste the meat so the flavour really packed a punch under the poached eggs and hollandaise. She did say though that it could have done with more jalapeños but she loves things really spicy. They also have a great drinks selection. Everyone in my family drink coffee except for me, but I love teas. When I saw they had a matcha latte on the menu I was really excited, not enough places have these on the menu and if you like the taste of matcha green tea (it's definitely an acquired taste) you'll love this creamy version of the hot drink. The Pantry is by far one of my favourite spots for brunch that is just outside of the main bustle of the city, but close enough that it is a convenient spot for breakfast with pals. Their menu takes classic your favourite classic breakfast dishes like waffles and eggs Benedict and turns them up a notch. I will definitely be back here again and again (and maybe order something other than the Epic Waffles... maybe).